Those who love mint and chocolate seem to really love mint and chocolate. I am one of these. 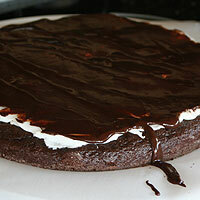 The day before I make this I like to make and refrigerate the mint filling, and measure the ingredients for the cake. It makes the job much easier when I go to bake and assemble it. 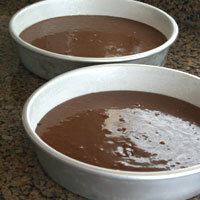 Prepare two 8 or 9 inch round cake pans in the following way. Place one of the pans on top of a piece of parchment or waxed paper. Trace around the bottom with a pen, or slide a scissors around the bottom to score the paper. Cut out and repeat. Spray the bottom of the pan with cooking spray and place the prepared paper inside. Smooth out any air-pockets and seal around the edges. Spray and flour the paper and edges. Shake out any excess. Set aside. 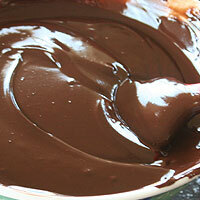 In a small microwave proof bowl, melt chocolate in microwave for 1 minute. Stir and microwave an additional 30-60 seconds. Stir until completely melted. Set aside. 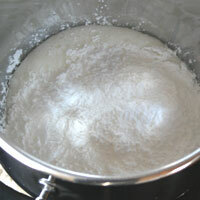 In a medium bowl stir flour, baking soda, baking powder, and salt. Set aside. Measure the sugar. Set aside. Measure the milk and set aside. 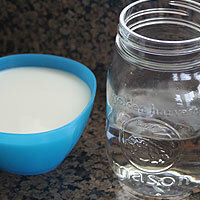 Measure the water and heat in microwave until boiling 1-2 minutes. Set aside. 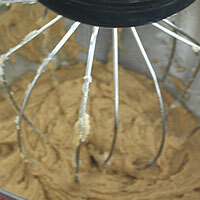 In the bowl of an electric mixer beat the butter 3-4 minutes with the whisk attachment. Add the sugars. Beat another 3-4 minutes. Add the eggs and vanilla and beat until eggs are incorporated. 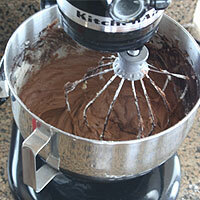 Turn the mixer off and add the melted chocolate. Mix until combined. With the mixer running add 1/3 of the flour mixture, then 1/3 of the milk. Keep alternating until it is all added. Beat on medium/high speed for two minutes. 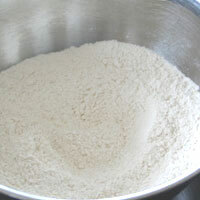 Remove bowl from mixer and gently stir in the boiling water until the batter is smooth. Pour into prepared pans. Bake 30 minutes. Test to see if it’s done by gently touching the middle of the cake. It should spring back, but just barely. If it sinks it needs a few more minutes. If it is firm, it’s overdone. Remove from oven and set on cooling racks. Gently run a knife around the cake to loosen it from the sides. Let cool 10 minutes. Run the knife around the edge again. Flip the pan over and release the cake onto a cooling rack. Remove the parchment or waxed paper. Cool completely. In a stainless steel bowl whisk egg whites, corn syrup, and salt. 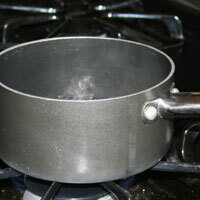 Reduce boiling water to simmer. Place stainless steel bowl over simmering water. 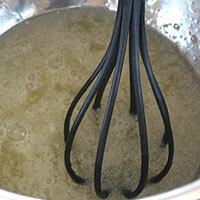 Whisk the mixture constantly until the temperature reaches (1)160 degrees. If you don't have a thermometer, the mixture should double in volume and be very light and frothy. Remove bowl from heat. Attach the paddle attachment on an electric mixer. Mix in peppermint and powdered sugar until the mixture comes together. 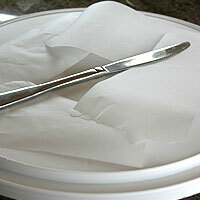 Line a jellyroll pan with parchment paper or plastic wrap and spray with cooking spray. Divide the peppermint mixture into three equal parts. Round each into a ball and place on parchment. Cover and refrigerate up to three days. In a microwave safe bowl melt both chocolates for one minute. Stir and microwave an additional 60-90 seconds. Stir until smooth. .
Add butter and let sit a minute or two. Add salt. Stir completely until smooth. Set aside until ready to use. Make the icing and set aside. 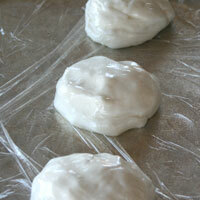 To make cleaning up around the cake easy, cut 5 or so pieces of parchment paper about 3 x 5 inches in size. Set in a circle on the serving tray. 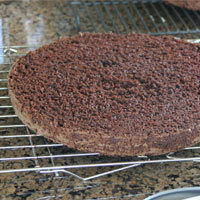 Using a serrated knife, (6)level each cake round to make them flat. Cut each cake round in half. Take one of the halves and place it on the parchment circle. Remove the peppermint filling from the refrigerator. Gently roll or stretch one of the rounds into a flat disc the size of the cake. Place the peppermint disc on the cake and stretch and patch it as needed. Cover with a thin layer of icing. Top with another halved cake round and repeat twice more. Top the cake with the last halved cake round. Ice the cake with a thin layer of icing. Refrigerate until it hardens slightly about 5 minutes. 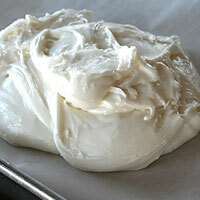 Add a second coat of icing and coat until smooth and even. 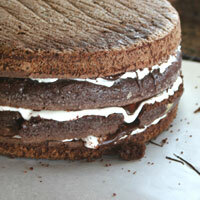 If using garnishes, add them now while the icing is still soft. Slide each piece of parchment out from under the cake. It is ready to slice and serve! Line a jellyroll pan with parchment paper. 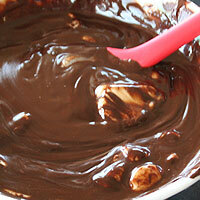 Melt the chocolate in a microwave safe bowl one minute. Stir and melt an additional 30-60 seconds. 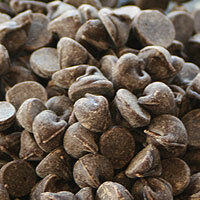 Fill a decorator's bag or container with the chocolate. Fit the bag with a medium round tip. 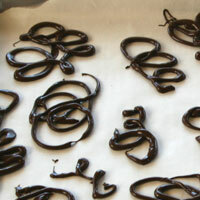 Squeeze the chocolate to form swirls and squiggles on the parchment paper. 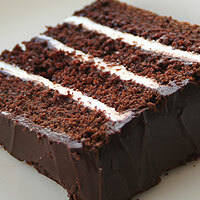 Make them 1-2 inches in width and height so they can fit unattached around the cake. 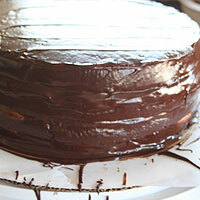 Refrigerate until chocolate is hardened, about ten minutes. . Remove and stack gently in an airtight container. Refrigerate until ready to use. Cut 8-10 peppermint patties in half. Set aside until ready to use. 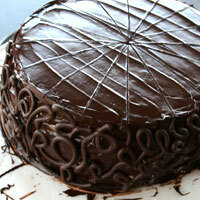 While icing is still soft add squiggle chocolate pieces around the sides of the cake. You will have to break some to make them lay flat. Score the top of the cake with a pizza cutter. 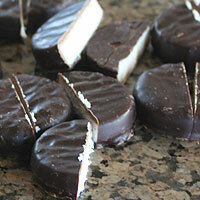 Place one halved peppermint patty on each scored slice. See chocolate cake for problems with the cake. -Don't heat the butter with the chocolate for the icing. The butter will melt and burn before the chocolate is melted. Add the butter to the chocolate after it's melted. -Be careful not to overcook the egg whites or it will taste eggy. Also the eggs will curdle if over-cooked giving it a chunky consistency. Too much - measuring too much powdered sugar will give the filling a gritty consistency. Too little - measuring too little will make the filling very sticky and difficult to handle. It's harder to get it even on the cake and makes a mess. Just the right amount of powdered sugar. 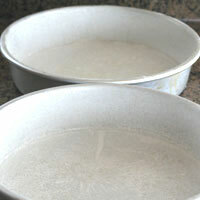 Prepare two 8 or 9 inch round cake pans in the following way. Place one of the pans on top of a piece of parchment or waxed paper. Trace around the bottom with a pen, or slide a scissors around the bottom to score the paper. Cut out and repeat. Spray the bottom of the pan with cooking spray and place the prepared paper inside. Smooth out any air-pockets and seal around the edges. Spray and flour the paper and edges. Shake out any excess. Set aside. 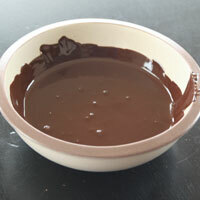 In a small microwave proof bowl, melt chocolate in microwave for 1 minute. Stir and microwave an additional 30-60 seconds. Stir until completely melted. Set aside. Measure the sugars and set aside. Measure a little more water than the recipe calls for and heat in microwave until boiling 1-2 minutes. Remeasure the correct amount and set aside. 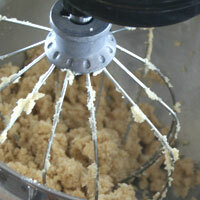 In the bowl of an electric mixer beat the butter 3-4 minutes with the whisk attachment. Add the sugars. Beat another 3-4 minutes. 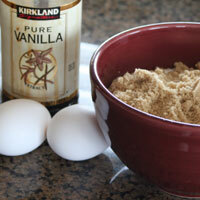 Add the eggs and vanilla and beat until eggs are incorporated. Turn the mixer off and add the melted chocolate. Mix until combined. With the mixer running add 1/3 of the flour mixture, then 1/3 of the milk. Keep alternating until it is all added. Beat on medium/high speed for two minutes. 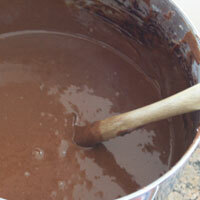 Remove bowl from mixer and gently stir in the boiling water until the batter is smooth. Pour into prepared pans. Bake 30 minutes. Test to see if it’s done by gently touching the middle of the cake. It should spring back, but just barely. If it sinks it needs a few more minutes. If it is firm, it’s overdone. Remove from oven and set on cooling racks. 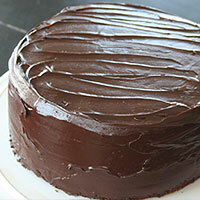 Gently run a knife around the cake to loosen it from the sides. Let cool 10 minutes. Run the knife around the edge again. Flip the pan over and release the cake onto a cooling rack. 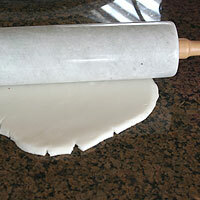 Remove the parchment or waxed paper. Cool completely. Bring a small pot of water to a boil. In a stainless steel bowl whisk egg whites, corn syrup, and salt. 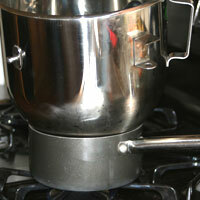 Reduce boiling water to simmer. Place stainless steel bowl over simmering water. 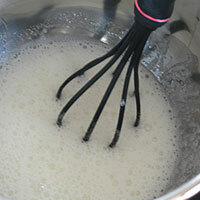 Whisk the mixture constantly until the temperature reaches (1)160 degrees. If you don't have a thermometer, the mixture should double in volume and be very light and frothy. Remove bowl from heat. Attach the paddle attachment on an electric mixer. Mix in peppermint and powdered sugar until the mixture comes together. 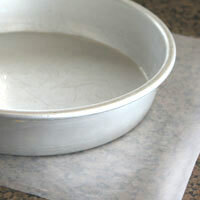 Line a jellyroll pan with parchment paper or plastic wrap and spray with cooking spray. Divide the peppermint mixture into three equal parts. Round each into a ball and place on parchment. Cover and refrigerate up to three days. 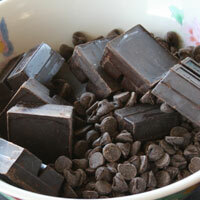 In a microwave safe bowl melt both chocolates for one minute. Stir and microwave an additional 60-90 seconds. Stir until smooth. Add butter and let sit a minute or two. Add salt. Stir completely until smooth. Set aside until ready to use. 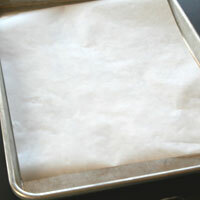 Line a jellyroll pan with parchment paper. 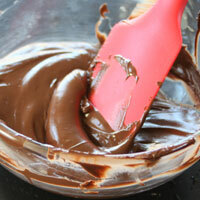 Melt the chocolate in a microwave safe bowl one minute. Stir and melt an additional 30-60 seconds. Stir until smooth. 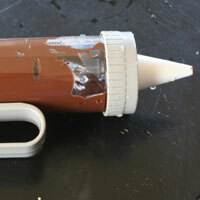 Fill a decorator's bag or container with the chocolate. Fit the bag with a medium round tip. 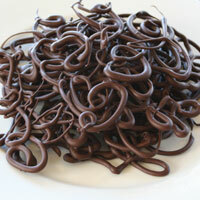 Squeeze the chocolate to form swirls and squiggles on the parchment paper. 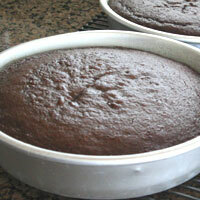 Make them 1-2 inches in width and height so they can fit unattached around the cake. 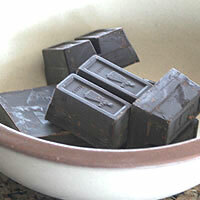 Refrigerate until chocolate is hardened, about ten minutes. Remove and stack gently in an airtight container. Refrigerate until ready to use. Remove the peppermint filling from the refrigerator and set aside. 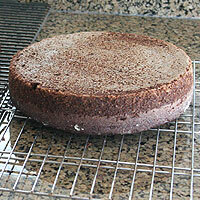 Using a serrated knife, (6)level each cake round to make them flat. Cut each cake round in half. Take one of the halves and place it on the parchment circle. Gently stretch on the peppermint rounds into a flat disc the size of the cake. 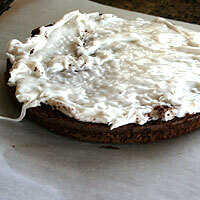 Place the peppermint disc on the cake and stretch and patch it as needed. Cover with a thin layer of icing. Top with another halved cake round and repeat twice more. Top the cake with the last halved cake round. Ice the cake with a thin layer of icing. Refrigerate until it hardens slightly about 5 minutes. 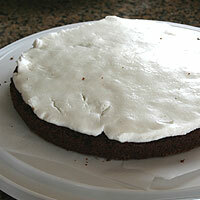 Add a second coat of icing and coat until smooth and even. 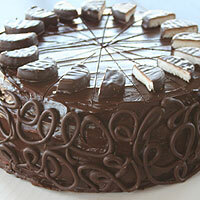 Garnish sides with the prepared chocolate swirls while the icing is still soft. Using a pizza cutter (7)score the top into 16-20 pieces. Place a peppermint patty half to each piece. Slide each piece of parchment out from under the cake. It is ready to slice and serve! 1. The eggs are pastuerized when they reach 160 degrees, so they are safe to eat.